Typically, when a business invests in a new piece of equipment, it cannot immediately deduct the full purchase price from its taxable income in the first year. Instead, according to federal tax regulations, it deducts a percentage of the price in each of 2, 5, or 7 years depending on the type of equipment. Businesses, of course, would prefer the tax deduction to happen in the first year so they have lower current taxes and therefore increased current cashflow which can be used to make additional investments that will pay off in the future. In an effort to help small businesses, the federal government has long allowed for all investment costs below a specified threshold by any given firm to be immediately deducted. This threshold, is specified in Section 179 of the tax code and is generally referred to as the Section 179 allowance. For example, in 2002, all investment costs below $20,000 could be immediately deducted from taxable income but investment costs beyond $20,000 were subject to normal rules. Since 2003, the government has worked to encourage business investment by significantly increased this threshold (see figure 1). Interestingly, as the government has increased the threshold, many states have made equivalent alterations to their state tax policies. 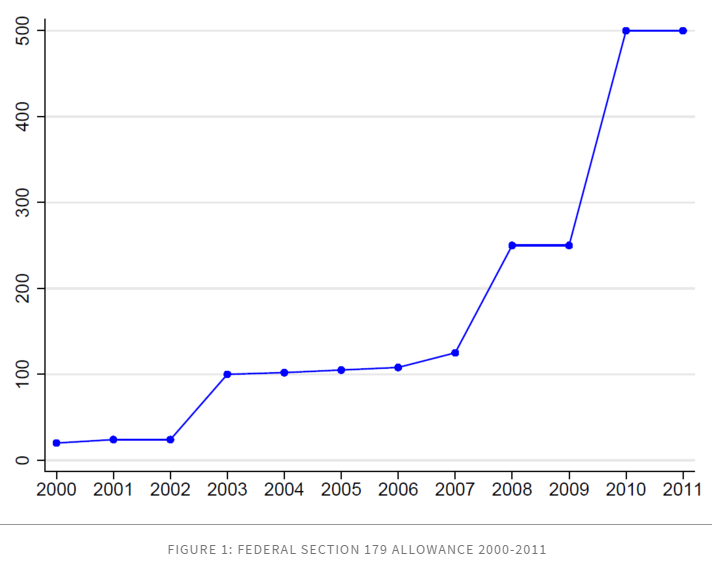 Other states have increased their Section 179 allowance some. Still others have not increased Section 179 generosity at all. In new research, I attempt to use this state-level variation in Section 179 generosity to estimate how manufacturing investment and employment respond to state Section 179 conformity. An important step in this research process has been demonstrating that states that do and do not conform to the federal threshold are not substantially different in other ways that would affect investment or employment trends. One major concern, in particular, is that conforming states might be concentrated in a single region. If investment and employment is changing in this region for reasons other than Section 179 conformity, then the research design, which compares conforming and non-conforming states, would inappropriately attribute investment and employment effects to state 179 conformity when, in fact, these effects are really due to regional trends. 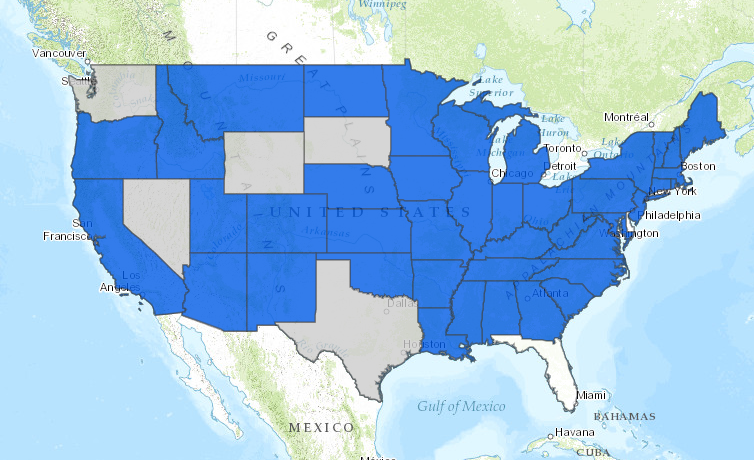 To allay this concern, I enlisted the help of Bonnie Brooks in DASIL to create an interactive ArcGIS application which shows the evolution of state 179 conformity during the years 2000 to 2011. From the application, it is immediately apparent that state conformity or non-conformity is not concentrated in any region. Thus, the ArcGIS application simply and elegantly allays concerns that regional trends may undermine the key assumption in this and all applied microeconometrics research project: that all else really is equal.